We all know about service or assistant animals. Dogs, monkeys, birds and even horses that are trained to aid the disabled in everyday life. Did you know that pets help people in other ways too? Pets can ease loneliness, reduce stress, promote social interaction, encourage exercise and playfulness, and provide unconditional love and affection. Caring for a pet may even help you live longer. I’ve touched on those in previous blogs. Other studies have shown that a simple meow from a cat or a dogs wagging tail can relieve tension and improve mood. Don’t have a pet? A great way to get the benefits of cats and dogs without owning one is to volunteer at CCHS. We love volunteers. In fact we couldn’t survive without them. We’re open from 10-2 and 5:30-7:30 so come on up and gain some health benefits. Until next time…..
CCHS has wonderful pets. We currently have Pickles, black tabby/wt; Felix, orange tabby; Shasta, buff; Blaire, black; Ices, gray/wt; Macie, white; Millie, Calico ; Mark, white. Available dogs include Bugsy, Puggle; Maximus, Trinity and Boone, Staffordshires; and puppies Reeta, Chihuahua/Terrier; Sammi, Shepherd/Plott Hound mix; Tilly, Lab mix. 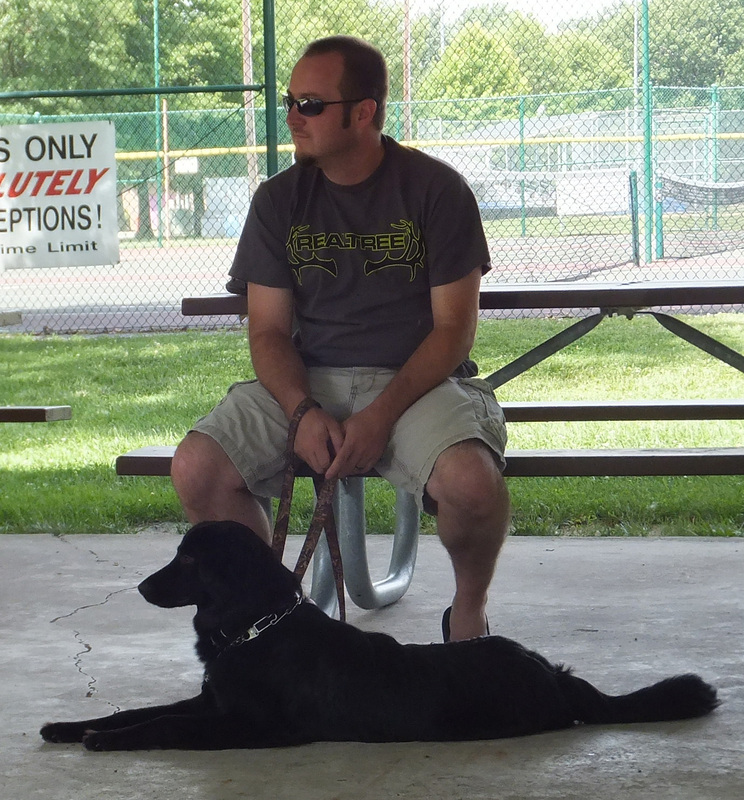 Dogs are fostered with families and can be visited by appointment or at the next Meet and Greet Saturday, July 19, at the Breese North Side Park from 10 a.m. until noon. 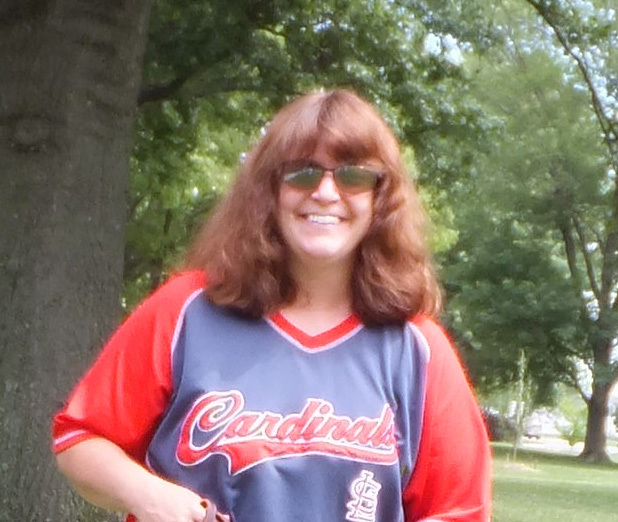 Kim McCauley has been selected CCHS Volunteer of the Month for July! Kim is the regular Tuesday gal at CCHS, taking care of office work, customer service, cleaning and pet care. She has taken on some extra duties and has even made friends with cranky Sinbad, the Scarlet Macaw in the office. Kim is up for whatever is needed and her efforts are much appreciated. 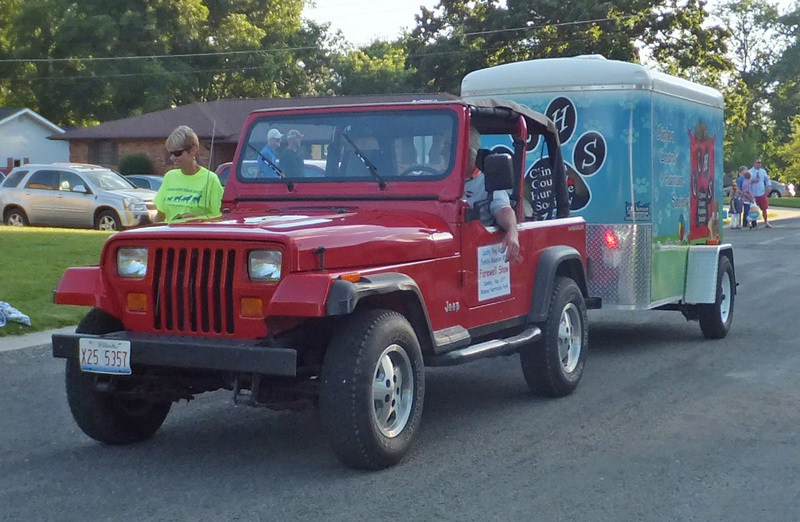 Nancy (walking) and Mark Tebbe (driving) made arrangements for the CCHS unit in the Albers Parade Thursday, July 3. 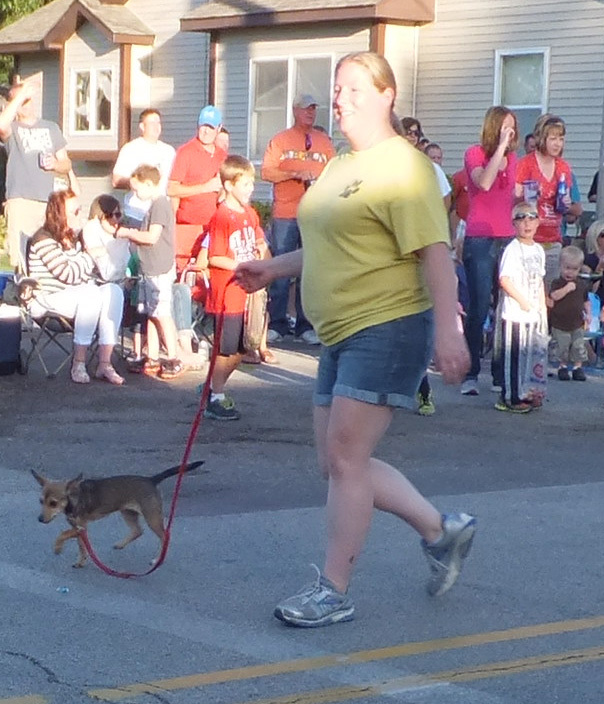 CCHS’s Reeta walked with her foster Beth Harpstrite in the parade. 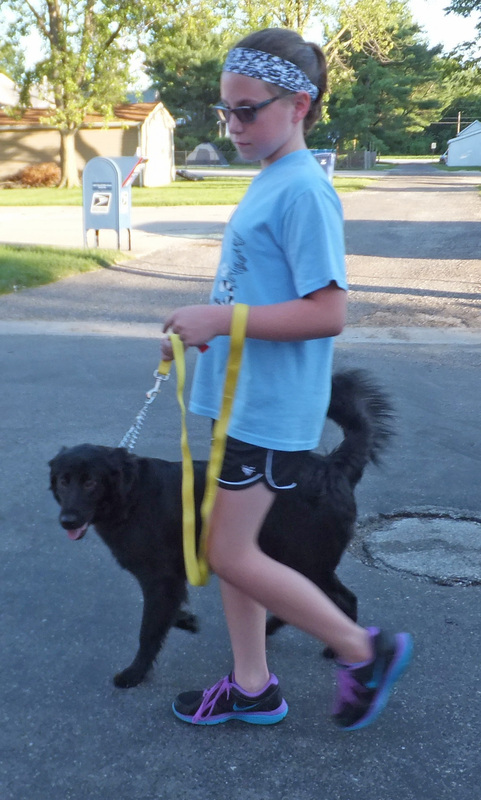 Luna (since adopted) escorted Zoey Dhass for most of the parade. 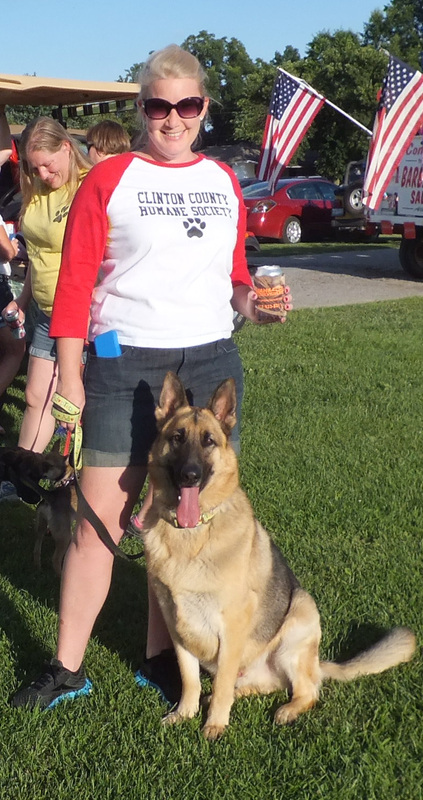 Max, CCHS alumnus, waited with handler Susan Toennies, while his owner took some pictures before the parade. 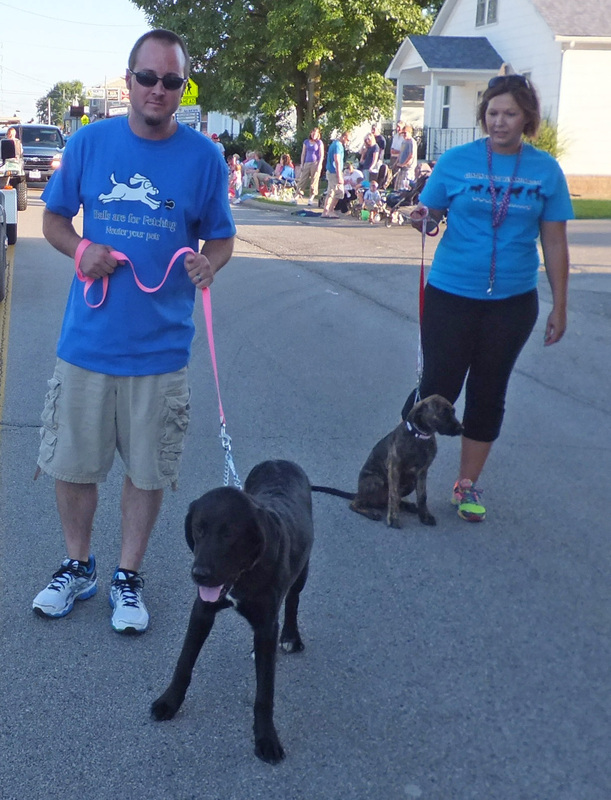 CCHS fosters John and Brandy Kessel walked Tilly and Sammi along the Albers parade route. Sammi, with handler Zoey Dhass, was ready for her first parade to get started. 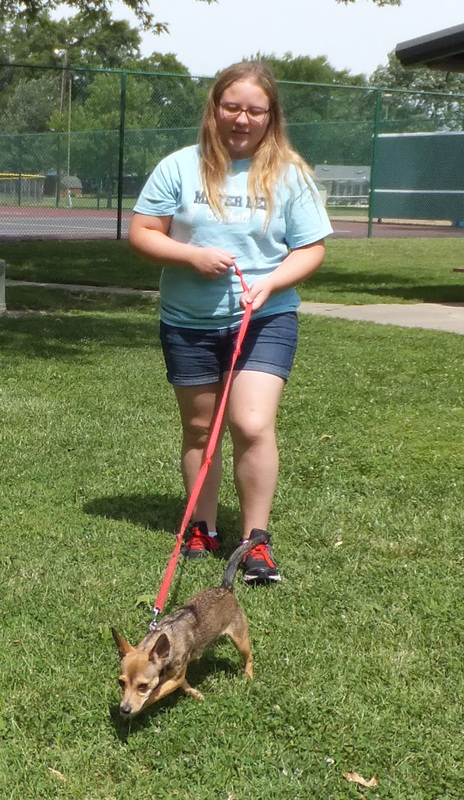 Sammi took a stroll with handler Josh Winkeler at Breese Park. 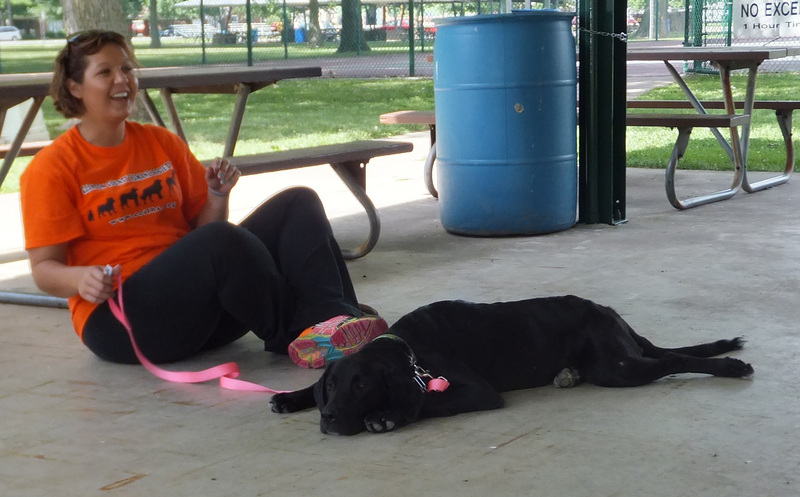 Relax was the word of the day for Brandy Kessel and Tilly. 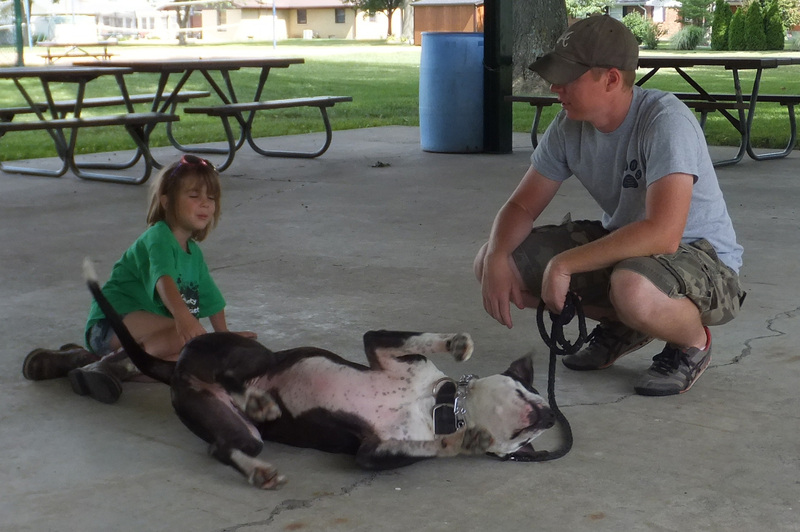 Trinity made it clear that she would like a tummy rub from Sophia Kessel or Josh Winkeler. Didn’t matter who! Little Reeta was ready to explore the park with foster Katlyn Harpstrite. Check your calendars and contact ccilhsvolunteer@gmail.com or call 526-4500 if you find a little time available, especially weekends 10-2 and evenings from 5:30 until 7:30 pm. The CCHS July Special is 20% off dog and cat collars and leashes. Dog Gone Smart lounger beds are available in five sizes at specially discounted prices. CCHS holds Meet and Greets the first and third Saturdays of each month. Folks can stop by and meet the CCHS adoptable pets at Breese North Side Park from 10 a.m. until noon Saturday, July 19. Micro-chipping for your pet will also be available for $25, including registration. The next regular CCHS meeting will be held Wednesday, July 9, at 7 p.m. at Knotty Pine. The group is currently making plans for the “Bark for Life” in October and will need volunteers to help. Meetings are open to the public and new members are always welcome.